After leading an exemplary sacrificial holy life, re-establishing the Orthodox Church in Czechoslovakia between World War I and II, this holy New Martyr of our modern times was martyred by the Nazis, after sacrificing himself in order to save his priests from Nazi retaliation. The future saint was born in Moravia in 1879 and was named Matthew Pavlik. He became a Roman Catholic priest. In studying the history of Slavic Christianity, and the missionary work of Ss. Cyril and Methodius, who brought Byzantine Christianity to Moravia in the latter half of the 9th century, he became a leader for reforms in the Roman Catholic Church. He sought to restore the Church to the way it was established by these missionary saints of his native land, including autonomy for the local Church, and use of the Czech language in Divine Services. After Czechoslovakia was established as a country in 1919, after World War I, Fr. Matthew was part of a delegation to Rome to request these reforms be implemented. When their requests were refused by Rome, 800,000 Czechoslovak Roman Catholics, including Fr. Matthew and other priests, petitioned Bishop Dositheus of the Serbian Orthodox Patriarchate (who had been active among Carpatho-Russians who were being reunited with the Orthodox Church) to receive them into the Orthodox Church. The following year Bp. Dositheus visited Prague, and Fr. Matthew converted to Orthodoxy. A year later he was consecrated Bishop of Moravia and Silesia, and given the monastic name of Gorazd (a faithful disciple of St. Methodius). Following the example of these faithful and holy missionaries to Moravia, Bishop Gorazd labored constantly to restore Orthodoxy in Czechoslovakia. He founded eleven churches; set up several parishes in Moravia and Bohemia; translated the Divine Services into Czech, for use in his parishes; published in the Czech language a prayer book, “Book of Needs” for priests, a catechism and various devotional works. He did not lose faith, but patiently bore the disappointment of seeing some of his fellow reformers abandon their ideals and turn back, and endured criticisms, false accusations, and all kinds of trials and tribulations. For all these things, he was highly respected by the Patriarch of Serbia. Then World War II descended on Bp. Gorazd’s country. In 1942, seven members of the Czech resistance to the Nazi invasion of their country took refuge in the crypt of the Orthodox Cathedral in Prague. They were captured and executed. The two cathedral priests were arrested, and the Nazi leaders were planning reprisals against the whole Orthodox Church. In order to protect his Church and his priests, Bishop Gorazd sacrificed himself, and claimed that he alone was responsible for what had happened. He was consequently arrested on June 25, 1942, and for 2½ months he was tortured by the Nazis, until he was finally shot on September 4th. Despite his voluntary self-sacrifice, the Nazis still retaliated and closed all the Orthodox churches in Czechoslovakia and sent all the Orthodox priests to concentration camps in Germany. 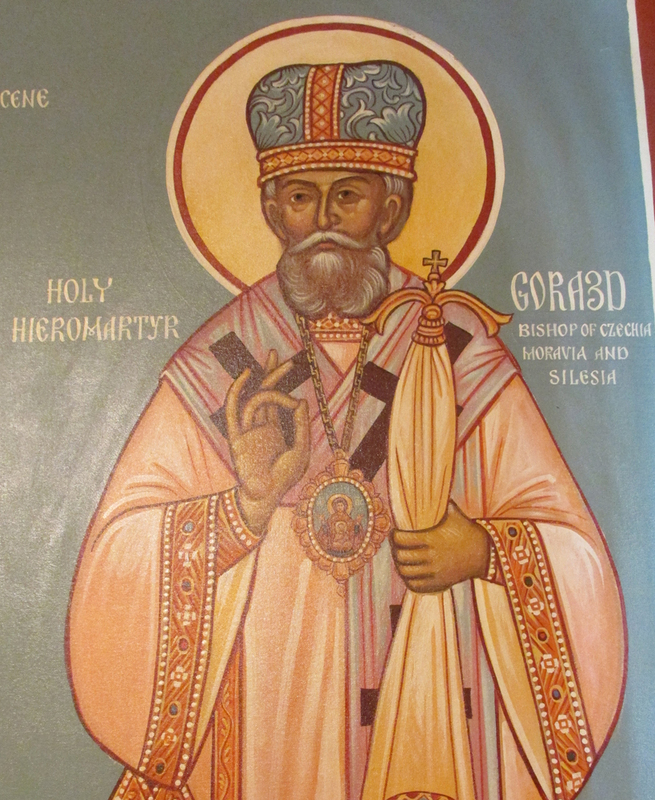 St. Gorazd was glorified as a saint in 1961 by the Serbian Orthodox Church, and was officially recognized by the Ecumenical Patriarchate in 1987.